Samantha Pattridge is the kind of leader who is admired by her students, the members of the department she leads, and her colleagues at large. She’s a UFV alumna who spread her wings on an academic and career journey that made several stops before she returned to her alma mater to teach in 2007, and eventually to take on the Communications department head role. She’s a mover and a shaker who supports bold ideas, such as bringing guest speaker Terry O’Reilly to campus (initially suggested by her colleague Marcella LaFever). This venture led to UFV’s most popular guest lecture ever. And she’s the inaugural recipient of the UFV Inspirational Leadership Award. In her nomination and letters of support, it was stated that Samantha exemplifies all that we value in a faculty member and leader at UFV. Her career is well-developed and multi-faceted. She is fully engaged and passionate in her work with and for students, both in and outside the classroom. 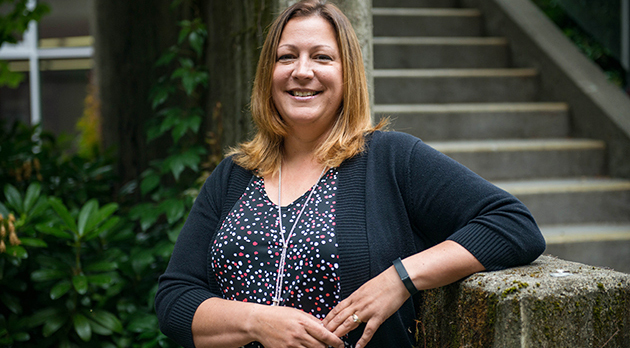 She takes a leadership role on committees, within her department, within UFV and the larger community, and in mentoring new faculty and committee members. She is an advocate for students and faculty, and an exceptional instructor. In serving as Communications department head for the past three years, she collaboratively led the program review and degree proposal, as well as ensuring a smooth transition of faculty recently transferred into the team. She is skillful, sincere and respectful in her interactions with others, modelling excellent leadership. She has a high level of integrity and dedication, and is an exceptional ambassador for UFV. Sam Schechter, a part-time instructor at UFV, nominated Samantha for the award as a tribute to her inspiring leadership style. “Samantha constantly inspires me to pursue new opportunities, showing genuine support for my career and professional development at UFV,” he noted. His colleague Kim Norman, also a faculty member in Communications, echoed his enthusiasm. “Samantha is clearly a rising star in our institution. She leads in ways that inspire those around her to aim high and always look ahead. She is an exceptional ambassador for UFV, a model leader for her colleagues and students, and a respected instructor and scholar,” she noted. During her time as department head, Samantha has led a program review, steered the completion of a degree proposal, and helped foster a “stress-free” working environment, according to communications faculty member Linda Pardy. She has also contributed to the larger UFV community by serving on the scheduling and registration task force and the BA task force, and chairing the Undergraduate Education Committee for three years and continuing to serve as a member. Samantha started her post-secondary education at UFV straight out of high school. After earning her BA at SFU, she went on to an MSc in writing and cultural politics at the University of Edinburgh, and an MA in English literature at the University of Alberta. Before returning to UFV as a faculty member, she taught in Alberta and at BCIT. She was delighted this spring when the Terry O’Reilly event was so successful. Because UFV needed to charge an admission fee to cover costs, there was some risk involved. “I was really proud of the way that successful event showcased our department,” she says. Courses in communication and the various specialty credentials available within her department have been growing in popularity in recent years. “Interest in the communication minor has grown in remarkable ways, and we have more grads than ever for our professional communication essentials certificate,” she says. “Our courses are popular across disciplines and have immediate applicability to students’ other courses. Pattridge was touched that her support came from members of the department and says she’s looking forward to continuing to work on developing a communications degree for UFV.